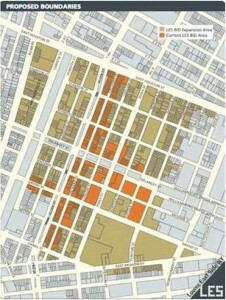 The Lower East Side Business Improvement District (BID) was established 20 years ago to revitalize the Orchard Street Shopping District; and over two decades it has remained mostly centered along an Orchard Street axis, with some expansion eastward down Delancey. 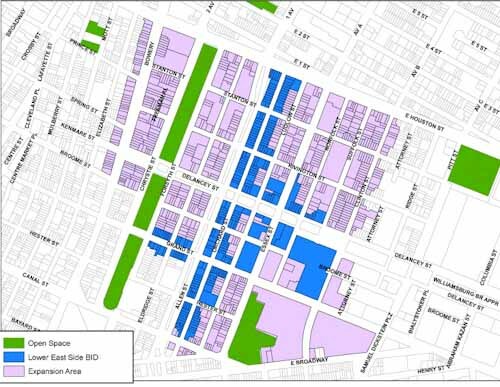 The economic development group is ready to grow, however, and spread its boundaries south to East Broadway, east as far as Pitt Street, and west across Chrystie to Bowery. LES BID officials presented their plans to the public at DL on Ludlow Street this week, according to Bowery Boogie, kicking off a long public review process to realize their territorial ambitions. The Lo-Down reports that the average annual fees assessed to property owners in the expanded BID would be $756 based on property valuations, and that the first-year annual budget for the larger footprint would be $990,000. One interesting question raised during the meeting: what will happen to the SPURA parking lots the LES BID currently controls, from which it derives significant revenue and free parking? If and when SPURA is developed, the LES BID may need an alternate source of revenue to replace the approximately half-million dollars it receives from those lots currently.